If you have seen this week's North Shore Outlook, you might have noticed a "Frightfully Fun" photograph promoting an amazing haunt at 1006 Belmont Avenue in North Vancouver. The Haunt is run by our customers Jim and Danielle Myers. Jim and Danielle dropped into our store again today and are seen here holding their Outlook photo. 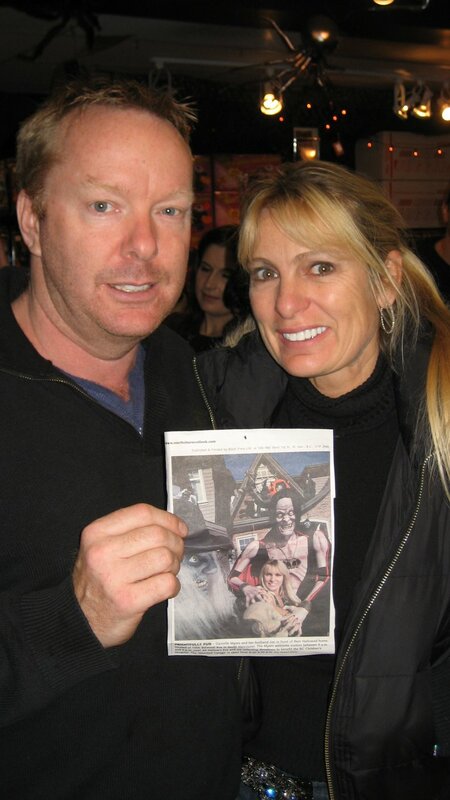 In the photo they are holding, Jim is wearing the amazing Giant Vampire walkabout costume he purchased at Thomas FX. The Myers' haunt is open from 6:30 to 9:30 pm every day until Halloween. Belmont is located just off Highland Avenue in the Edgemont Area of North Vancouver. Make sure you drop by and make a donation to B.C. Children's Hospital. Don't forget to let Jim and Danielle know that you appreciate what they are doing to make a difference in our community. They really went over the top to make sure their neighbourhood haunt was the best.